(Sept 3):Wall Street stocks jumped almost 2% on Wednesday in the latest volatile session as investors weighed the impact of a stumbling Chinese economy and global market turmoil on the Federal Reserve's impending decision about when to raise interest rates. US investors have weathered over two weeks of unusually wide-swinging trade that has left the S&P 500 with its worst monthly drop in three years and a loss of 8.5% from an all-time high in May. "What we're seeing today is not a recovery. It's market volatility, it's nervousness, it's an inability to call the direction of the market," said Jake Dollarhide, chief executive officer of Longbow Asset Management in Tulsa, Oklahoma. "Through now and October we're going to see a lot more of this, a lot of volatility." US labor markets were tight enough to fuel small wage gains in some professions in recent weeks, though some companies already felt a chill from an economic slowdown in China, the Fed said. The combination of more demand for workers and worries about Chinese economic growth underscores the challenge faced by the Fed at a Sept 16–17 meeting where it may decide to raise interest rates for the first time since 2006. The Dow Jones industrial average jumped 1.82% to end at 16,351.31 points. The S&P 500 climbed 1.83% to 1,948.85 and the Nasdaq Composite surged 2.46% to 4,749.98. The CBOE Volatility index, Wall Street's "fear gauge," dipped 11% but stayed in territory not seen since 2011 after Standard & Poor's cut its credit rating on the United States for the first time. The recent turbulence has left the S&P 500's valuation at 15.1 times expected earnings, inexpensive compared to around 17 for much of 2015, according to Thomson Reuters StarMine data. But investors fear that the outlook for earnings may darken as China's economy loses steam. Concerns about China's economy pushed major US indexes down almost 3% on Tuesday and intensified fears of a long-term selloff. On Wednesday, all of the 10 major S&P sectors were higher, led by the technology index's 2.6% rise, helped by Apple, up 4.29%, and Microsoft, up 3.68%. Shares of banks and bond insurers rose after Puerto Rico's indebted public utility PREPA reached a deal with a key bondholder group. OFG Bancorp surged 19.59% and First Bancorp rose 9.81%. Ambarella slid 8.51% after the chipmaker's third-quarter revenue forecast failed to impress investors. Key-customer GoPro fell 5.52% after Raymond James said Ambarella's forecast likely means GoPro will not launch more products this year. Volume was lighter than in recent days. 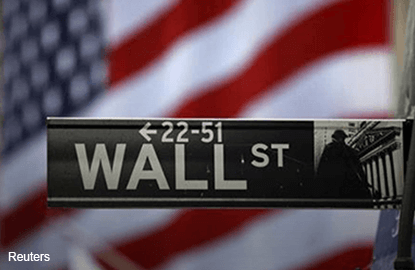 About 6.7 billion shares traded on US exchanges, compared to an average of 9.1 billion in the past five sessions, according to BATS Global Markets.